Finally after a couple of minor setbacks like having to completely rebuild an existing tunnel and not realising they needed planning permission to re-open an existing railway into Oxford, Chiltern Railways finally announced that the inaugural service between Oxford and London Marylebone would commence on Monday December 12th 2016. 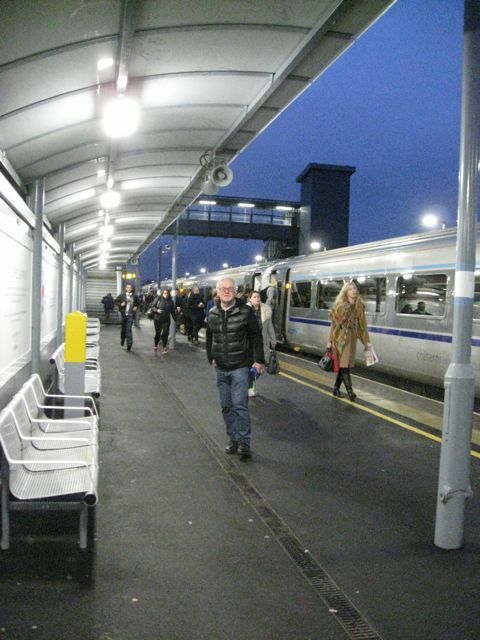 Chiltern Railways, our darling of the rail network, have been running trains between the new station at Oxford Parkway and Marylebone since 2015. 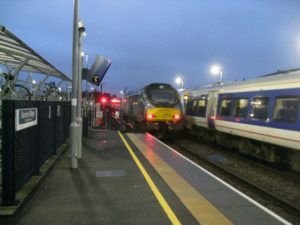 The project to reconnect the old Varsity Line from Oxford to Cambridge has been ongoing for a fair few years now and reconnecting this line to Oxford and the old Great Central Railway marked the first stage in linking the two cities. Wolvercote Tunnel was the last hurdle and once complete Oxford station would then be linked to Oxford Parkway and onwards to London and east to Bletchley, Bedford and eventually Cambridge. Over eleven miles of new track was laid, a large set of grain silos demolished, two stations rebuilt and one new one built, level crossing and bridges sorted and the track doubled. The journey time to London from Oxford was estimated to be just over an hour, bit of an improvement on the old route to Paddington which is often closed! The next stage will be to rebuild the track from Bicester to Bletchley and then linking up Aylesbury Parkway to the Varsity Line allowing trains to run to Milton Keynes once more. Well now me mate, dear old Bazzer, who is by no means a railway buff, had drawn attention to this and I whole-heartedly agreed that we should be on it. 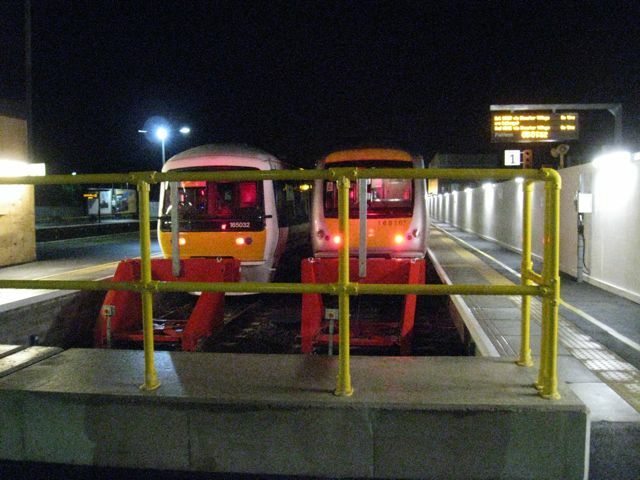 First proper train into Oxford was time-tabled to run from Bicester Village on the 12th December 2016 at 05.46. Now in the summer that is OK as it is light but deep December, it is decidedly dark. This was deemed Old and Rusty stuff. The calls went out. 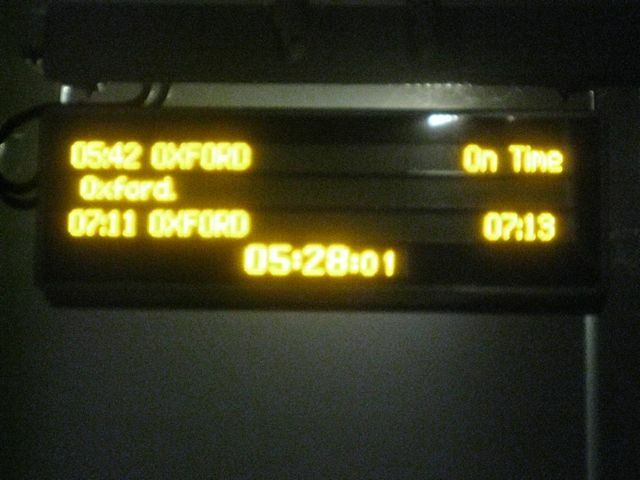 “Hey Nick do you want to come on the first train into Oxford I’ll pick you up about ten to five?” I enquired. “You are kidding?” and the line went dead. Stewpot declined with the excuse he had lots of things that needed doing that were important and it would be dark. Paul was a bit worried we wouldn’t be back before the dray arrived which was fair enough but did offer to give us an alarm call around half four. So it was a very early start in very foggy and I mean very, very foggy conditions that I set out for Bicester. 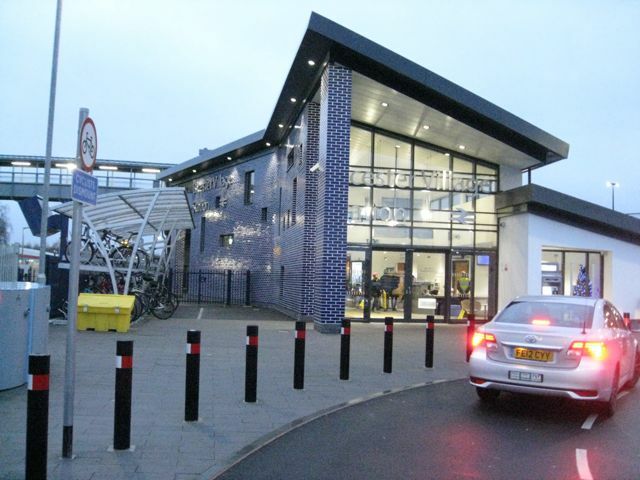 Now I hadn’t really paid much attention to the new Bicester Town station mainly because, like ley-lines one tries to go around Bicester so I don’t pass it. It is actually now called Bicester Village and has a direct link to the Village itself and very popular it is with the Orientals. Rumour has it that during the busy times announcements are in English and Japanese. The station is on the Oxford side of the level crossing and has an exceedingly high footbridge connecting the Up and Down platforms to accommodate the overhead cables when it eventually gets electrified. It also has a very good café called Little Italy (we’ve got one on Wendover station) which traditionally, as far as we were concerned, was shut but it was 05.30 in fairness. Rather surprisingly there wasn’t anyone about. No marching band, free commemorative gifts or champagne. When B&Q opened a new store they had the works. This seemed strange considering this was the first train even if it was only rostered from Bicester Village to Oxford having run down from the Banbury depot. Hey ho. Baz did the honours with the ticket machine and if I remember correctly the fare was a fiver return and the carpark eight quid. If you’ve ever driven into Oxford and tried to park this will seem remarkably good value. If you’ve been caught in traffic on the A34 it represents fantastic value! In our little deserted world it was fine but we regretted not taking a hipflask or bottle of bubbly to celebrate the moment. Spot on time, in the murk, the flashing crossing lights announced the arrival of our train By now two more people had turned up and I think Barry spotted someone with a camera who told him it was a Class 168 Clubman 168107 but he may have imagined that. 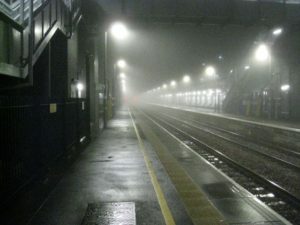 As it was dark and foggy we didn’t get to see anything of the route in but it was smooth and quiet and rather relaxing. Two new bays have been constructed at Oxford to serve the route and we were now two of seven passengers that alighted to no fanfare or press throng at Oxford. We had a chat to the driver who was equally surprised that there wasn’t a reception committee. He thought he was going to be late at Bicester on account of the thick fog but managed to make it just about right and went on to say that the ‘Cake train’ was the 07.20 to Marylebone and it was to be a Class 68 pulling one of the old Wrexham and Shropshire silver sets. As an aside, and for the purists out there, the original Wrexham and Shropshire trains had Class 67s but you don’t really need to know that!!! He was running it down to the sidings to see if it would fit! We bade him a fond farewell and headed into town to see if we could score some brekkie. At sixish in the morning Oxford on foot is desperate. It was filthy. Every other doorway had people sleeping in it under piles of boxes and sleeping bags and nowhere except McDonalds was open and despite the ads McDonalds don’t do 'breakfast'. Rubbish was piled high awaiting collection. We went to all the old places that used to be home to an early morning café the best having been in a hut on the approach to the station but craned away some years ago. And there’s another thing. Oxford has spent a fortune ‘improving’ (sic) their road system and to that end they have completely toshed over what was the station approach and introduced what they call a 'free-flow traffic system' which integrates vehicles and pedestrians, trouble is that the vehicles don’t know that! The junctions at the City centre end, each side of The Royal Oxford Hotel are also too sharp for the bigger buses to negotiate which means that with low kerbs and no crossings pedestrians are fair game. What passes for road edges are badly damaged and there are anti-skateboarding devices on the planters. The litter level was impressive. It is supposed to be the gateway to Oxford. Personally I’d get back on the next train out! Oh, and the well-endowed Oxford ‘Ox’ statue opposite the railway station entrance was obscured by a ‘Welcome to Oxford’ or somesuch sign. As for discarded chewing gum! This wasn’t really living up to expectations. Eventually after going to the covered market where we discovered the café there didn’t open until eight and even trying the prestigious Oxford Old Gaol Hotel (breakfast from 07.00 but the doors were locked!) we gave up and headed back to the station catch the first train to Bicester and see if Bicester Village was open! That's desparation! Although I agree that steam engines working hard are pretty impressive there is nothing quite like a proper diesel engine and that is exactly what we could hear as we rounded the corner by the site of the old Rewley Road station (now rebuilt at Quainton Road). Like schoolkids we peered through the station sidegate at the very throaty, rumbling Class 68 that clearly meant business. A couple of trainspotters joined us. “Bloody brilliant isn’t it.” one said as a statement not a question. “Never seen one up ‘ere before, let alone a Chiltern Railways one.” said the other. “Its forming the 07.20 to Marylebone, don’t you know.” I said and immediately regretted it as Baz crumpled up with badly disguised outburst of mirth and merriment. It did sound rather good though as it leisurely gently throttled up a tad and pulled out heading for the sidings. They are diesel electric and built in the Czechy Republic and fitted with a Caterpillar engine which chucks out a respectable 3800hp and makes a point of letting you know. OK so a couple have caught fire but it is a great sounding train nonetheless (great word that we do try and use on every occasion). We wandered into the station and checked the next train out only to discover it was the 07.20. This explained the strange entourage that had gathered in the concourse. Hey ho! 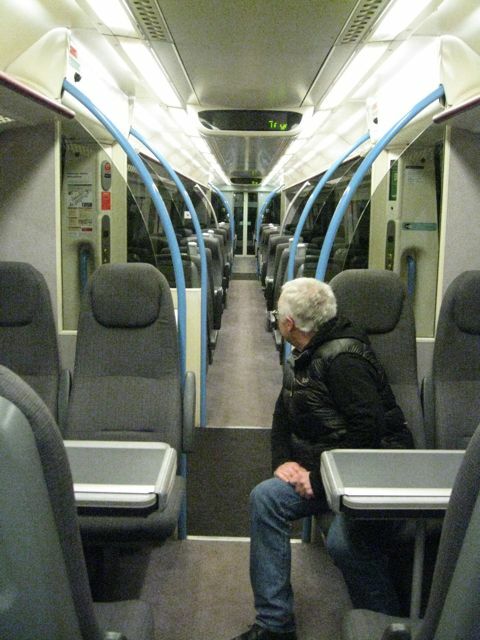 looked like this was the press train then. We’d catch it anyway and to pass the time we elected to get a bacon roll from the Cornish Pasty Company which, to be fair, was OK and wander over to platform four. We sauntered off down to a quieter spot presently occupied by fellows with cameras and notebooks and watched a train of endless empty flat cars rumble through. Then a good old HS125 pulled in going to Newcastle. The driver jumped out and asked us if he’d really seen a Chiltern Railways ‘68 in the sidings and was it rostered? I didn’t fall for that again but told him we thought it might be the 07.20 to Marylebone and best he asked the bloke with the rucksack and camera. He was delighted and we commented that Newcastle was a long way away. He said he was getting off at Leamington (or was it Peterborough) disappeared into the cab and told us it would be in Newcastle around three? Which way was it going we wondered? I’d forgotten how friendly and humorous railway folk could be. Anyway a few minutes late our very shiny train arrived and we gave a customary wave to the beaming driver. 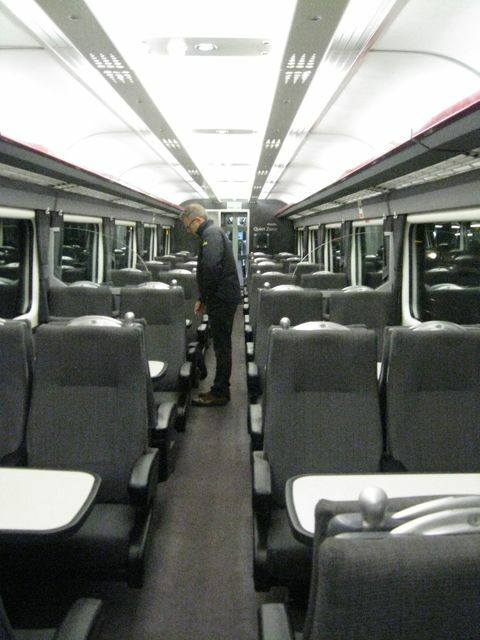 The set was made up of rake of modernised and upgraded Mark 3 coaches, surely the most comfortable quietest carriage on the tracks, with a Driving Van Trailer (DVT) at the front and a Class 68 at the back. More history needed. The Mk3 coach was originally designed back in the seventies for the high speed train, now more commonly known as an HS125 a truly classic shape which is still in service throughout the country. Mk3 coaches are of monocoque design and originally had slam doors and interiors that didn’t meet the regulations for the disabled so Chiltern Railways had their sets rebuilt with what are known as sliding ‘plug doors’ and sorted the interiors. They also reckon that plug doors over slam doors save about 90 seconds a stop! Turned out it was far cheaper than ordering new multiple unit trains. Capable of 125mph and with air over coil suspension they give a fantastic ride. That they are still in service today speaks volume of their strength and durability. They are sweet. Unaware of all this history, which we tried valiantly to explain, the press pack swarmed about eager to get their story and headed for the DVT, tapes running to get the drivers’ story. Cameras whirred and blinked and buzzed. Copy was sent by eely mail along with pictures of the toilet doors, a dozen passengers and the driver, no doubt. We were thrilled. 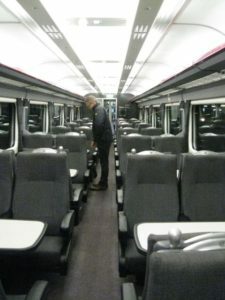 As we very gently pulled out of Oxford and over the points heading for Marylebone ‘Via Oxford Parkway and Bicester Village’ the announcer said and then proceeded to greet us aboard this first direct service between Oxford and London in a very polite dutiful manner. This was a big comfy train but it was largely empty. A very nice chap from Chiltern Railways came and chatted explaining that they would be using this rolling stock for the early fast trains and thanked us for being on the first train and here was a free weekend rover ticket each to use on any of the Chiltern Railway trains as a memento. Brilliant. 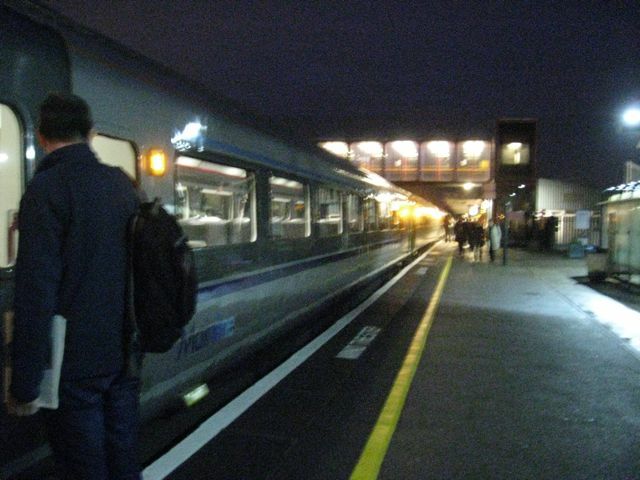 Now it has to be said that it doesn’t take long to get from Oxford to Oxford Parkway but the moment we got there and the doors opened the train completely filled up. It hadn’t really occurred to us that this early morning service had been running for over a year so these were all hardened commuters who did commuter type things like set out their tablet wotsits, thermoses and sandwiches for the journey. Some were wearing Lycra and headtorches! We felt like we’d taken a Germans’ sunlounger or were sitting in Robert from Fritwells’ seat. “He always sits there you know? He won’t like it.” “Do you have you any idea how much a season ticket costs?” We could brave it out as we were getting off at the next stop and we did. The announcer had different ideas. “The next stop will be Oxford Parkway.” The regulars weren’t listening so our chuckle went unnoticed! It was still dark but not quite as foggy when we pulled into Bicester and so we still hadn’t seen the line. Quite a few of the journos bundled out and whizzed to the front of the train for piccies clearly not wishing to experience Monday morning rush hour in London. 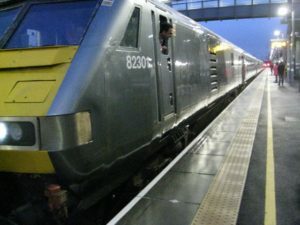 For those not versed in phrases like Class 68 and despite the interesting facts given earlier, it is indeed a diesel but the engine is at one end only. The other end has a DVT (some even noted the number on the side of the driving car, 82301) so you don’t need to run the engine round. There is no real noise from the DVT end of the train and so as it pulled out you had to wait until the diesel engine itself came thundering and roaring by dispensing vast amounts of horsepower. Interestingly, if you are that way inclined, there were a few of us waiting to clock the Class 68s’ number which we didn’t having given our pencil to a journo. After all that excitement and the red tail lights of the first train from Oxford to London, next stop Marylebone, clattered over the old A41 Little Italy beckoned and we ordered coffee. Proffering the money, a very nice lady told us it was on Chiltern Railways until nine. Would it be rude to get a second cup. Probably, so we didn’t but spent the time watching the next couple of trains come and go the London bound one packed to busting. We decided we would be well happy catching a train to Oxford in daylight next time and with luck go and have a pint in the Kings Arms and maybe a bit of grub in Maxwells where I haven’t been for years. Its probably closed. Whatever, it will be a grand weekend out courtesy of Chiltern Railways. May even visit Little Kimble.